· Boil the potato keep it aside. · Heat oil in a pan and add mustard seed, when start to spluttering adds urad dal sauté until urad dal become brown in color. 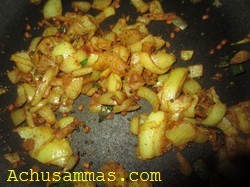 · Add onion,ginger,choppe green chilli,curry leaves and fry for a 5-10 minutes. · Add turmeric powder, coriander powder,chilli powder,garam masala powder and sauté for a while. 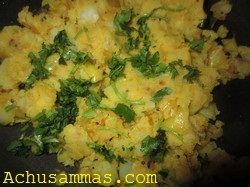 · Add the mashed potato and mix well with masala, let it cool. · Meanwhile make the batter, add gram flour, rice flour and all – purpose flour, little salt and the water. Batter should be medium thick consistency. · Make a smooth round shape. 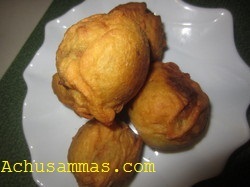 · Dip the potato balls and fry they are become golden brown. · Serve with chutney, tomato ketchup. 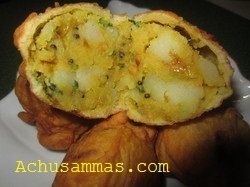 very tempting aloo bonda...perfectly done! 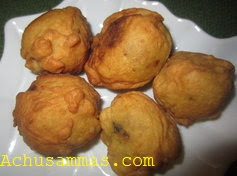 I love aalo in any form & this bonda is a all time fav :).. super! 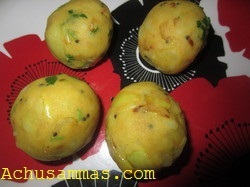 The urulaikizhangu bonda looks very yummy..
looks yummy dear!!!! happy to follow you, do stop by mine when u find time!!!! Hot hot bondas looks perfect. Hot bondas with a hot cup of chai, what more can I ask for. Looks yummy! Perfectly shaped ones,yummy tea time snack! !